DIRECTIONS – Leave your house. Go to the nearest grocery store and get the ingredients to make this. NOW. 🙂 Tomorrow is another possible snow day, and THIS is what you should have on hand!! I made a pot last night, and its been lunch and dinner today, and I’m not complaining! 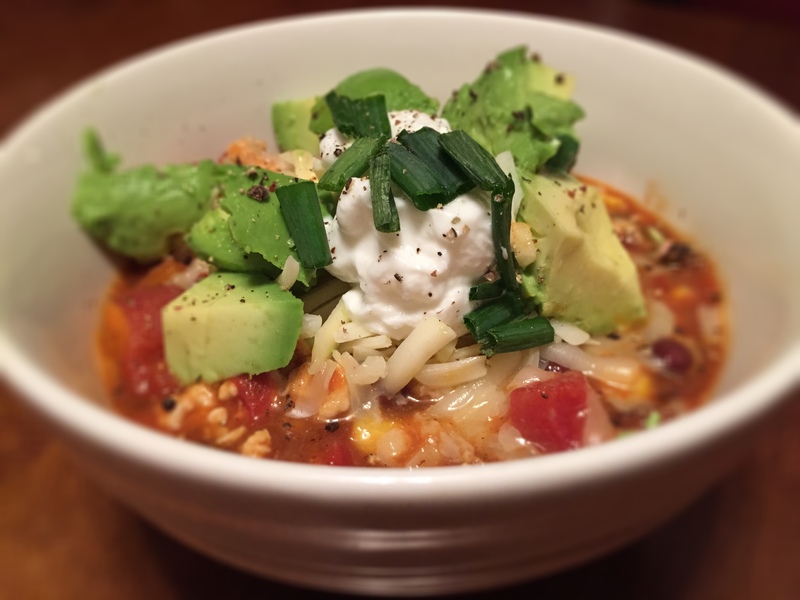 This chili has it ALL. Protein, meat, veggies, greens…the whole 9. I found the original recipe on one of my favorite blogs Love and Lemons. I made a few adaptations, so check out her original! She added chilies and onions to hers – I added ground turkey for another dose of protein. So good, so hearty, so healthy!! This is a perfect snow day meal! Heat oil in a medium-large pot over medium heat. Add the green onion, garlic, a few pinches of salt and cook until translucent (5 minutes or so). Add chili powder, and stir. Cook until fragrant (about 30 seconds), then add the vinegar, followed by the tomatoes. Stir, then add the broth and the sweet potato cubes and beans. While the sweet potatoes are simmering, brown your turkey meat in coconut oil with salt and pepper. and simmer for 5-10 more minutes. Add a good squeeze of lime. Taste and adjust seasonings – adding more salt and pepper as needed. Serve topped with toppings of your choice! Right Ema?! Sooooo good!! Such a fan! ← There’s SNOW Reason Why You Can’t Eat Healthy in a Blizzard!